Ok yesterday I was still mourning over how a lot of Korean comedies are a good laugh but lack substance. But today I finished another Korean comedy on Netflix, and it totally proved me wrong. I had low expectations going in, but Going by the Book was HILARIOUS! 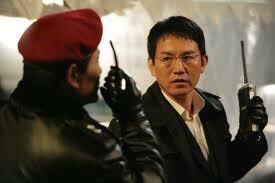 Synopsis: Jung Jae-young plays Jung Do-man, a low-ranking traffic cop. He follows all the rules, and is the perfect citizen. Do-man has a strict moral compass that never sways. For example, he even pulls over and gives a ticket to his new boss, the new police chief Lee Seung-man, played by Song Beung-ho. Recently, the banks in the city have suffered a string of robberies. Seung-man responds by declaring a “robbery drill” during which a “robber” will rob a bank and the police will respond as if it were a real situation. The media is called to cover everything in hopes of showing the public how the police are ready for the next incident. Seung-man appoints Do-man to be the robber. However, he is not prepared for Do-man the “robber.” Do-man has performed meticulous research and has prepared to commit a successful robbery. Hilarity ensues. Thoughts: Jae-young’s stoic face is what really gets to me. Although the situation is supposed to be serious, it just really funny because you know it’s fake. In addition the police’s struggles to respond to Do-man’s intricate plans. I also love that Seung-man keeps thinking he has control of the situation but Do-man never ceases to surprise him with another stunt. It’s really funny the embarrassment and exasperation Seung-man suffers as a result of his decision to make Do-man the robber. However, he can’t blame Do-man since Seung-man is the one who told Do-man to play the part to the best of his abilities. The side characters are cute as well. Like Do-man’s mom who is called to talk to her “robber” son and persuade him to free the hostages. She obviously doesn’t understand the seriousness of the drill and just calls out to him, telling her she needs his seal for tomorrow. These incidents just made me dissolve into fits of laughter. I just thought the whole plot was extremely clever and much more creative than most of the Korean comedies around. It didn’t leave a lot of plot holes or strings untied. I would definitely recommended his movie 100%. Go watch it. Now! oooh i haven’t seen this one before!! jung jae young is always amazing 🙂 i need to watch this stat! Where can i watch this? Is it available online? I had fun watching this movie, Hope to hear more good references from you.Thanks. i had fun watching this movie. Thanks. I remember this movie from last year. I watched it on dramacrazy. Its so funny and I laughed so hard mind you I was drinking at the time!! omigoshhhh.. that was a hilariously awesome movie. I laughed all the way through. A must-see for sure. Great catch whitecarrot. I watched this movie based on your review, I really enjoyed it. I find that the humor is similar to british humor where it’s dry as compared to the american humor which is more laugh out loud funny.